Condition: Generally: Good. Faye Valentine. Contents include character summaries (illustrated with specially created artwork) and an episode guide illustrated with images from the series. Contents include galleries of the main and supporting characters illustrated with images from the series, an interview with the voice over cast (in Japanese), and pages of pre-production art. 2.5" 6cm HEIGHT. FINAL FANTASY >. UK DESPATCH! NO ORIGINAL BOX. (↓Reference image. ONE PIECE >>>>. Be aware! AKIRA >>>>>>>. ). COWBOY BEBOP HG IF. BANDAI JAPAN. LENGTH 3" 8cm. FINAL FANTASY >. UK DESPATCH! VERY GOOD CONDITION! ONE PIECE >>>>. Be aware! COWBOY BEBOP HG IF. UK DESPATCH! BANDAI JAPAN. EIN LENGTH 1.2" 3cm. ED HEIGHT 2" 5cm. FINAL FANTASY >. ONE PIECE >>>>. Be aware! COWBOY BEBOP HG IF. BANDAI JAPAN. LENGTH 3" 8cm. FINAL FANTASY >. UK DESPATCH! ONE PIECE >>>>. Be aware! (↓Reference images. ). FINAL FANTASY >. UK DESPATCH! THE PLASTIC BAG IS UNOPENED. THE BOX HAS BEEN OPENED FOR CHECKING WHAT'S IN THERE, BECAUSE THIS IS A BLIND BOX ITEM. (↓Reference image. Be aware! ONE PIECE >>>>. GUNDAM >>>>>>. ). YAMATO JAPAN 2005. LENGTH 5.5" 14cm. UK DESPATCH! FINAL FANTASY >. Be aware! ONE PIECE >>>>. AKIRA >>>>>>>. GUNDAM >>>>>>. YAMATO JAPAN 2005. LENGTH 4.5" 11cm. UK DESPATCH! FINAL FANTASY >. Be aware! MINT CONDITION! It was new! NO ORIGINAL BOX. YAMATO JAPAN 2005. LENGTH 5.5" 14cm. UK DESPATCH! FINAL FANTASY >. THE BOX HAS BEEN OPENED, BECAUSE THIS ITEM IS BLIND ITEM, I HAD TO CHECK WHICH ONE IN THERE. ONE PIECE >>>>. Be aware! (↓Reference images. ). Be aware! CDs >>>>>>>>. FINAL FANTASY >. AKIRA >>>>>>>. GUNDAM >>>>>>. EVANGELION >>>. ONE PIECE >>>>. 5" 13cm HEIGHT. UK DESPATCH! FINAL FANTASY >. NO ORIGINAL BOX. ONE PIECE >>>>. Be aware! (↓Reference images. I have a used one too. ). 2.8" 7cm HEIGHT. FINAL FANTASY >. CLEAR COLOR VERSION. ONE PIECE >>>>. NO ORIGINAL BOX. Be aware! AKIRA >>>>>>>. GUNDAM >>>>>>. 3" 8cm HEIGHT. FINAL FANTASY >. UK DESPATCH! NO ORIGINAL BOX. (↓Reference image. ONE PIECE >>>>. Be aware! AKIRA >>>>>>>. ). YAMATO JAPAN. UK DESPATCH! HEIGHT 2.5" 6cm. FINAL FANTASY >. (↓Reference image. THE BOX HAS BEEN OPENED, BECAUSE THIS ITEM IS BLIND ITEM, I HAD TO CHECK WHICH ONE IN THERE. ONE PIECE >>>>. GUNDAM >>>>>>. ). 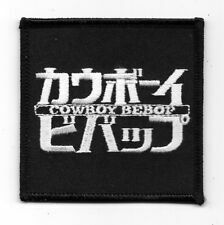 Cowboy Bebop. Extra Story Image. Bandai Anime Collection Spiegel Valentine Swordfish Cowboy Bebop MOC Figure Set. Condition is New. Shipped with USPS Priority Mail. This 142-page soft cover book is a collection of sketches and commissioned paintings by Toshihiro Kawamoto. UK DESPATCH! Be aware! CDs >>>>>>>>. FINAL FANTASY >. AKIRA >>>>>>>. GUNDAM >>>>>>. EVANGELION >>>. COWBOY BEBOP HG IF. UK DESPATCH! HEIGHT 4" 10cm. BANDAI JAPAN. FINAL FANTASY >. VERY GOOD CONDITION! ONE PIECE >>>>. Be aware! COWBOY BEBOP HG IF. UK DESPATCH! BANDAI JAPAN. FINAL FANTASY >. HEIGHT 3" 7.5cm. VERY GOOD CONDITION! ONE PIECE >>>>. Be aware! UK DESPATCH! 4" 10cm HEIGHT. FINAL FANTASY >. NO ORIGINAL BOX. (↓Reference image. ONE PIECE >>>>. Be aware! AKIRA >>>>>>>. ). 2.7" 7cm HEIGHT. FINAL FANTASY >. UK DESPATCH! NO ORIGINAL BOX. (↓Reference image. ONE PIECE >>>>. Be aware! AKIRA >>>>>>>. ). ONE PIECE >>>>. Be aware! CDs >>>>>>>>. FINAL FANTASY >. AKIRA >>>>>>>. GUNDAM >>>>>>. EVANGELION >>>. (1) Copy the item number. Size: Approx 7cm in height. Original Production genga from Cowboy Bebop. 9"x12" approximate. These are rare so don't miss out. Hand drawn. (1) Copy the item number. Size: Approx 9.5cm in height. 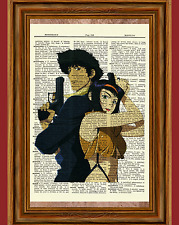 COWBOY BEBOP. FAYE VALENTINE. Statue in Box. Cowboy Bepop Knockin' on Heaven's Door Movie Art Book Japanese Language. Item are pre-owned but in good condition. COWBOY BEBOP Ein ANIME PRODUCTION CEL Plus Three Other Cels. All in sleeves and mint condition. Book Title. Book - B/C. Used Book x 1. Condition ----- GOOD(A-B-C-D-E)BAD. Cowboy Bebop Cel without douga. Get them for your own collection before you miss your chance. Vintage ODM Cowboy Bebop Spike Spiegel t-shirt. Shows character on front and logo on one sleeve. Size Small. Chest- 17", Length- 26", Sleeve- 7". (43.18cm, 66.04cm and 17.78cm) Good condition. Cowboy Bebop Manga Anime Guide 1-4 with Shooting Star book lot. A little more than half the set. Books show some minor age wear to them along edges & spines. A rare Anime lot. Be sure to check out my other vintage items listed this week.